Like the candle, the diffuser is made up of essential oils of grapefruit, bergamot and lime. It's got the same uplifting zesty fragrance as the candle, but without a flame, it almost seems fresher and lighter. After a while, the scent just blends into the background, but it's always noticeable after a long day away from home, and I usually turn the reed sticks around every few days to help boost the fragrance. As always with Neom, it comes beautifully packaged, and I think the frosted glass looks suitably chic and elegant on my desk. My only complaint is that the bottle stopper is extremely hard to remove. I'd much prefer it if they used a screw top lid instead. 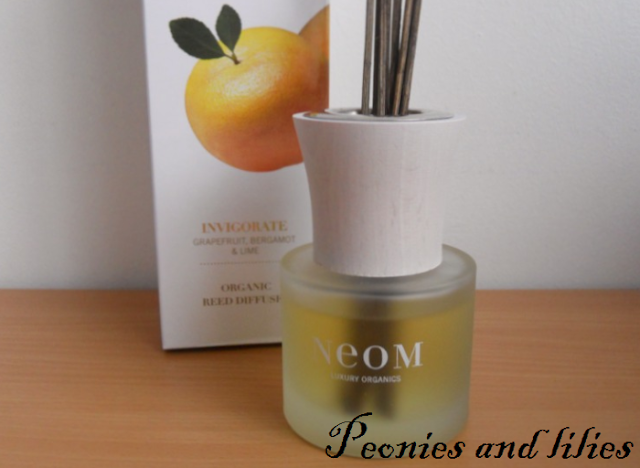 Bottle stopper aside, I think this is another great product from Neom. I love anything citrus scented, and the fact that it's flame free means it's great for fragracing a room when I'm out and about during the day. Definitely one to consider if you want to treat yourself or if you're looking for a nice housewarming gift for a friend. Have you tried any of the Neom organic reed diffusers? What's your favourite Neom scent?